Images: Top, intertangled mass of articulated fish from the Tanis inundation surge deposit. Middle top, Robert DePalma and Peter Larson conduct field research in Tanis. Middle bottom, micro-CT image showing cutaway of clay-altered ejecta spherule with internal core of unaltered impact glass. Bottom, researchers from left to right, Jan Smit, Robert DePalma, Walter Alvarez, David Burnham, with a collected box core sample of the KT boundary from Tanis. Images courtesy Robert DePalma. A $100,000 grant from the David B. Jones Foundation will help to develop a new generation of paleontologists at the University of Kansas, enabling students to pursue fieldwork in locations such as Wyoming and Turkey aimed at solving some of evolution’s deepest mysteries. Photos: K. Christopher Beard, KU Foundation Distinguished Professor, and a student work at a field site in Turkey. Eocene rock outcrops yield fossils at these sites. Photos by Gregoire Metais. Chris Beard’s article, “Out of Asia: Anthropoid Origins and the Colonization of Africa,” was recently published in the Annual Review of Anthropology. Previous research has attempted to explain the dispersed geographic distribution of anthropoid primates by hypothesizing tectonic rifts between South America and Africa as the cause, but Beard points out that those predictions conflict with the chronology and the topology of anthropoid evolution. In this article, Beard identifies and discusses biological and geological factors that support the assertion that the cause of dispersal was the crossing of marine barriers by early monkeys on natural rafts. To read the full article, please click here. 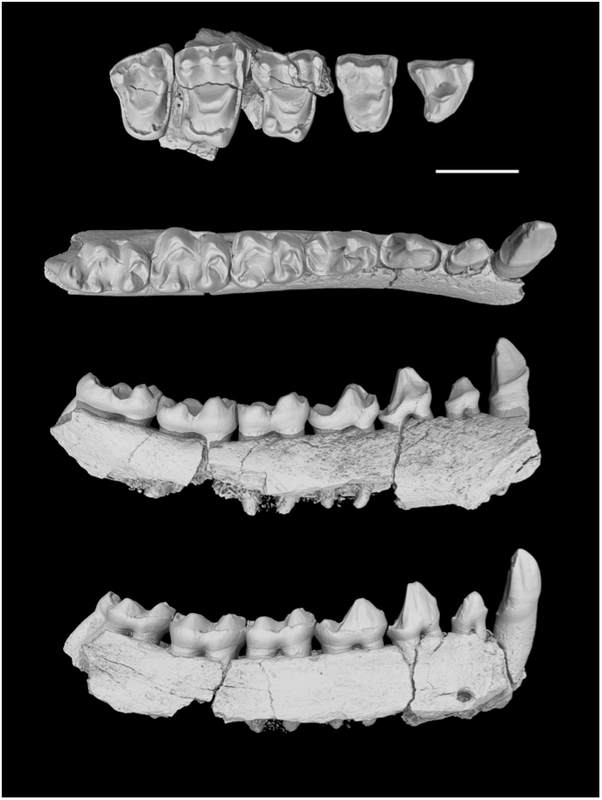 LAWRENCE — In a study to be published this week in the journal Science, researchers describe unearthing a “mother lode” of a half-dozen fossil primate species in southern China. Because anthropoid primates — the forerunners of living monkeys, apes and humans— first appeared in Asia, understanding their fate on that continent is key to grasping the arc of early primate and human evolution. The paper is the product of a decade’s worth of fieldwork at a site in southern China, where the primates likely sought warmer temperatures. Beard and his colleagues Xijun Ni, Qiang Li and Lüzhou Li of the Chinese Academy of Sciences’ Institute of Vertebrate Paleontology and Paleoanthropology describe the six new species from jaw and tooth fragments, which survived the ages due to their tough enamel surfaces and serve as “fingerprints” to identify ancient animals. Like most of today’s primates, the KU researcher said the ancient Chinese primates were tropical tree-dwellers. One of the species, which the research team has named Oligotarsius rarus, was “incredibly similar” to the modern tarsier found today only in the Philippine and Indonesian islands. Beard said that if not for the intense global cooling of the Eocene-Oligocene transition, the main stage of primate evolution may have continued to be in Asia, rather than transitioning to Africa where Homo sapiens eventually emerged. Indeed, the team’s findings underscore a vulnerability to climate change shared by all primates. LAWRENCE — During upheaval in Libya in 2013, a window of opportunity opened for scientists from the University of Kansas to perform research at the Zallah Oasis, a promising site for unearthing fossils from the Oligocene period, roughly 30 million years ago. From that work, the KU-led team last week published a description of a previously unknown anthropoid primate — a forerunner of today’s monkeys, apes and humans — in the Journal of Human Evolution. They’ve dubbed their new find Apidium zuetina. Significantly, it’s the first example of Apidium to be found outside of Egypt. Beard said evidence that Apidium had dispersed across North Africa was the key facet of the find. He believes shifting climatic and environmental conditions shaped the distribution of species of Apidium, which affected their evolution. With a forest broken up, there was an inhibition of gene flow that through time resulted in speciation, or the creation of new species, according to the KU researcher. Beard said that Apidium zuetina would have been physically similar to modern-day squirrel monkeys from South America, but with smaller brains, and would have dined on fruits, nuts and seeds. The team identified Apidium zuetina through detailed analysis of its teeth. Yet, the researchers chose to name Apidium zuetina not after any of its physical characteristics, but after the Zuetina Oil Company that made the dangerous Libyan fieldwork possible. Beard said the discovery took place during a brief lull in violence in Libya. But the trip to the Zallah Oasis was precarious nonetheless. Beard said armed guards accompanied the team everywhere, manning trucks mounted with antiaircraft guns. Beard’s research collaborators were Pauline M.C. Coster of KU; Yaowalak Chaimanee and Jean-Jacques Jaeger of the Université de Poitiers in France; and Mustafa Salem of Tripoli University in Libya. Photos: Above, armed guards accompanied researchers during their dangerous Libyan fieldwork. Below: Researchers analyzed fossil teeth to identify Apidium zuetina as a species new to science. Map: (A) location of Zallah Oasis in Libya’s Sirt Basin and (B) closeup of Zallah Oasis and surrounding area.